Robert Rauschenberg is frequently remembered for his series of work created in the 1950s and 1960s that combined aspects of both painting and sculpture. Rauschenberg himself called them "Combines", a term he invented to describe a work that is neither a sculpture nor a painting, but rather a hybrid of the two. The artist was always one to experiment and fuse, often creating something new from two entirely different substances. 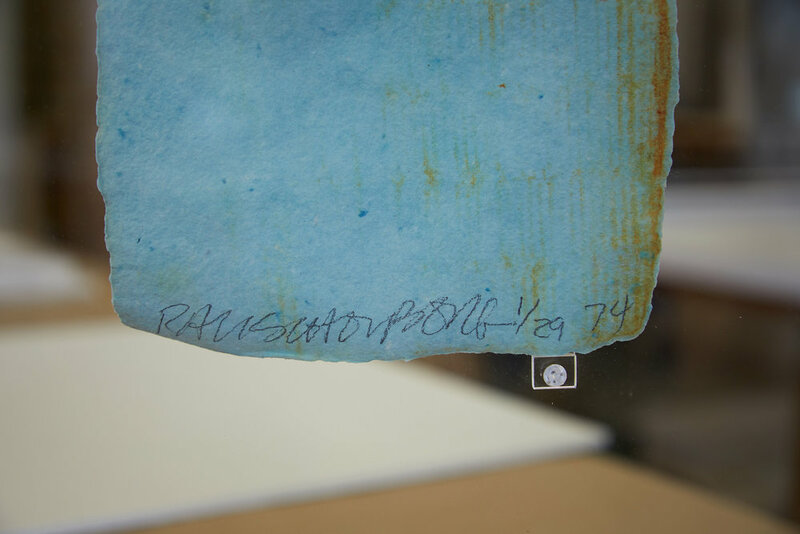 Recently, one of Rauschenberg's curious pieces came to The Center. The piece, hand made of pulp paper offset and silk screen, is the first print in a 1974 edition of 29. 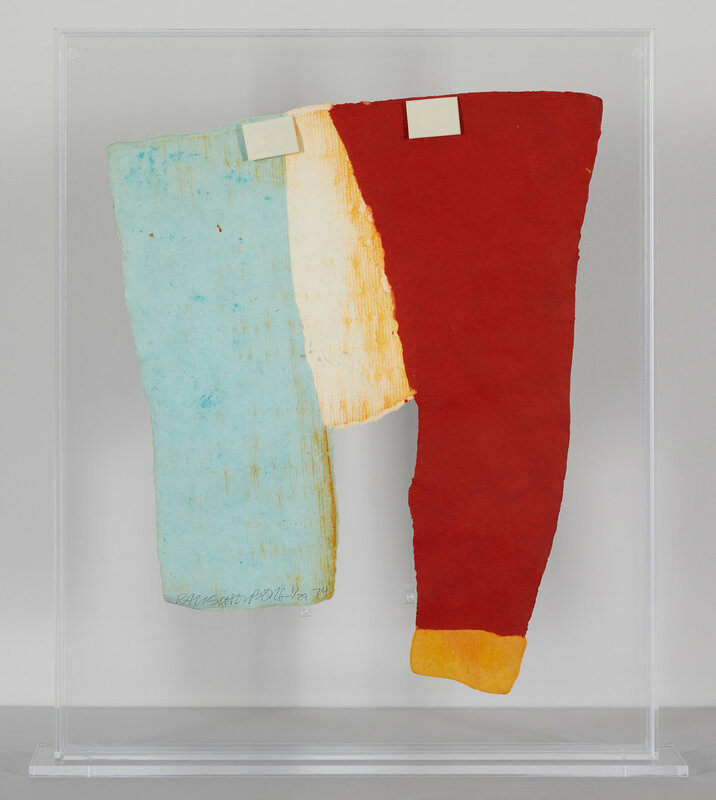 The work recalls 16th–19th century “cabinets of curiosities” and seems to be a satirical, modern take on the vitrines often found in natural history museums; however, rather than a taxidermic bird or butterfly, Rauschenberg created wing-like shapes on the paper pulp. The work came to The Center in a vitrine that was non-UV filtering and exhibited age-related yellowing. The vitrine also exhibited a moderate layer of particulate film and heavy scratches, and was broken along the lower right proper edge. The piece itself exhibited inherent distortion and age-related discoloration throughout. 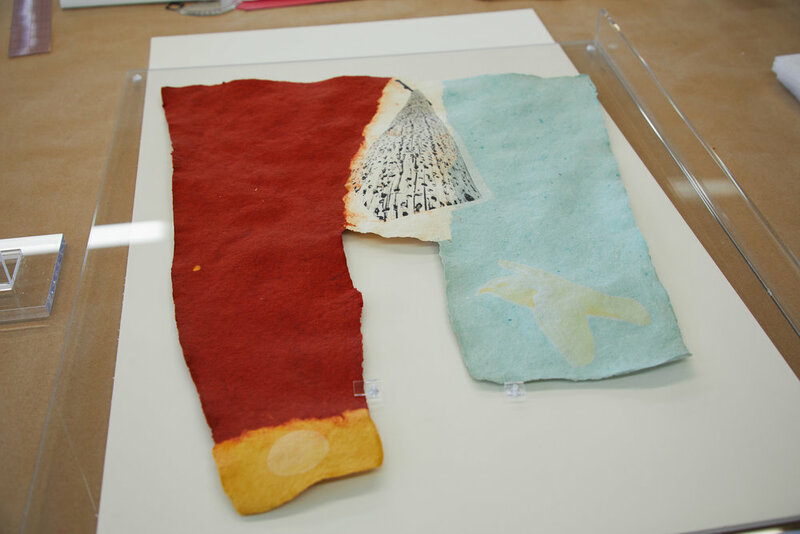 Our Paper Conservators carefully surface cleaned the piece using a textile sponge and a soft brush. Due to the nature of the work, our conservators noted that the general discoloration was inherent to the piece and would remain post-treatment. After the work was cleaned, our Framing Conservators carefully mounted it in a new UV-filtering vitrine. A custom mounting system was created using clear acrylic screws and brackets to suspend the piece in the vitrine. The brackets engaged the face of the piece, creating a design that allowed for the recto and verso of the piece to remain visible once the work was placed inside the vitrine. Freshly cleaned and remounted, the work is now on its way back home to live on as the paper-pulp curiosity Rauschenberg intended it to be.